The Name in the Flower celebrates the 150th anniversary of the publication of Darwin’s On the Origin of Species with commissioned work by Georgia Russell and Sam Winston. Inspired by Ruth Padel’s Darwin: A Life in Poems, the artists respond to the zoologist and the poet through dissections of their writings. The exhibition is held in the Library Exhibition Space, Courtauld Institute of Art, London. On Sunday afternoon, Stuart Brisley was one of the prominent artists, poets, philosophers and musicians participating in the Serpentine Gallery’s weekend-long Poetry Marathon in Kensington Gardens. It was the final event to take place in the Serpentine’s 2009 Pavilion designed by SANAA. 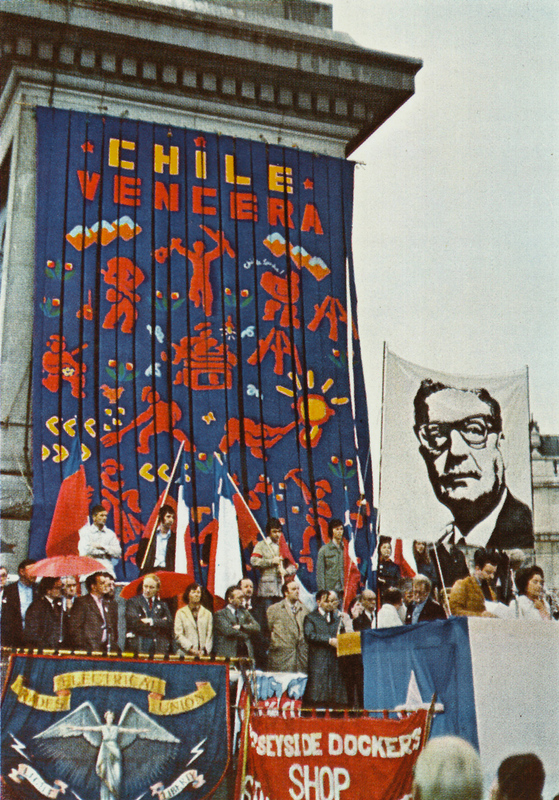 John Dugger’s Chile Vencera banner in Trafalgar Square, London in 1974. Two historic banner works by artist John Dugger are featured in a major new exhibition at the Antwerp Museum of Contemporary Art (M KHA) – the Great Wu Shu Kwan (Martial Arts) Banner 1975-77; and Chile Vencera, 1974. Textiles: Art and the Social Fabric is curated by Grant Watson and also includes works by James Lee Byars, Goshka Macuga, Hélio Oiticica, Rosemarie Tröckel and Yang Fudong. Chris Kenny is among the artists whose work is featured in the exhibition Collage: London/New York at FRED (London), co-curated with the Pavel Zoubok Gallery, New York. This celebration of collage features important works from the last 100 years alongside contemporary innovations. The exhibition includes more than 69 artists from the past hundred years, each working in very different ways, but all of them incorporating collage in their work. Chris Kenny and Georgia Russell are among the artists whose work is featured in the exhibition Cut It Out: Contemporary Paper Cut Artists at the Southampton City Art Gallery until 18 October. The exhibition then travels to Maidstone Museum, where it can be seen until 7 February 2010. One of the highlights of this year’s Les Rencontres d’Arles international festival of photography is a major retrospective exhibition of works by Brian Griffin, including the series Team and Water People. Chris Kenny is one of seven artists commissioned to celebrate the tercentenary of the birth of British writer and lexicographer Samuel Johnson. The exhibition, The House of Words, is at Dr Johnson’s House in Gough Square, London EC4, and is open to the public. Artists including Yoko Ono and David Medalla who feature in Constellation: Clay Perry’s photographs of London’s avant-garde art scene in the 1960s are among those who have responded to the exhibition on their own websites and blogs. Harald Smykla marked the City X exhibition at England & Co with a performance of his Movie Protocol: Metropolis in which he used a monitor and overhead projector to make a simultaneous transcription of Fritz Lang’s 1927 film onto rolls of clear acetate; his pictographs were projected onto the gallery wall behind him as he worked.